Are you struggling with how to wear your hair on your wedding day? We believe your dress, along with a few other tips, can help you make this decision a lot easier! 1. Think about your comfort. You WANT to be comfortable on your wedding day and your hairstyle has a lot to do with that! Maybe you hate when hair is in your face, in that case you'll want to wear it at least half back, maybe you sweat a lot, so wearing your hair up in a nice updo or bun is more practical. Whatever it is, you don't want to be messing with your hair or feeling irritated by it on your special day. Once Upon A Time Wedding Real Bride wearing a strapless neck-line with her hair down. 3. Will you be wearing a headpiece, veil, or maybe flowers in your hair? If you have a vision of wearing something in your hair that can also help you create a hairstyle around the headpiece. Here are a few examples of different headpieces with different hair styles. 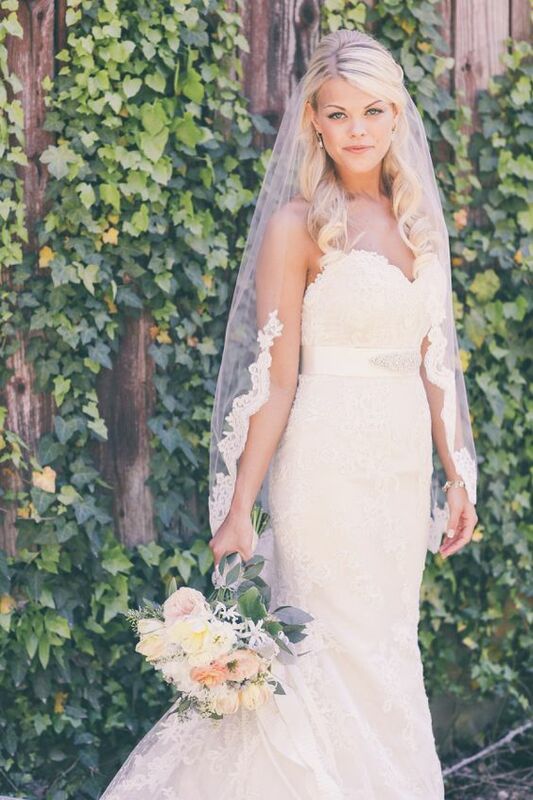 A veil is a classic look for any wedding gown. We especially adore veils with lace wedding gowns. Sometimes with a low back wedding gown or an illusion back wedding gown a headpiece is best as it doesn't compete with the back details. A flower crown is perfect for that more Boho wedding gown look. It's the perfect addition for outdoor weddings and looks amazing with many different styles of dresses. Maybe you know what hairstyle you want but you haven't found the perfect headpiece or veil, well we've got you covered here at Once Upon A Time Weddings. We have just received some new hair vines, veils and headpieces to complete your bridal look! Once Upon A Time Weddings Headband. Once Upon A Time Weddings Headpiece. Haven't found your dress yet either? Book your experience with us today!